You are here: Home / Wendy Knits / Awwwwwwww, thanks! Hey, thanks, you guys, for all the great comments on my Hot Stuff! mittens. I’m blushing here. I shall now proceed to answer some questions. I’ve never made two color mittens. Do nails, rings, etc. ever bother the floats? Long-time readers will remember that I am a floater, not a weaver. But for mittens and gloves I make an exception and I weave more along the back, specifically so that there is less chance of catching a float when inserting or extracting a hand. I generally don’t have a problem with this because I tend not to wear rings in the winter, and my nails are always filed the moment they develop a rough spot. Could you show a picture of how the inside of one looks? I especially love the picot edging. Is that Channel Island cast on? No, that is the Lazy Woman’s picot edge. Regular cast-on, knit 6 rows. Knit one row of yarn-over, knit 2 together around, Then knit straight and turn the 6-row facing to the inside and sew down. There’s not a lot of progress since yesterday’s photo. 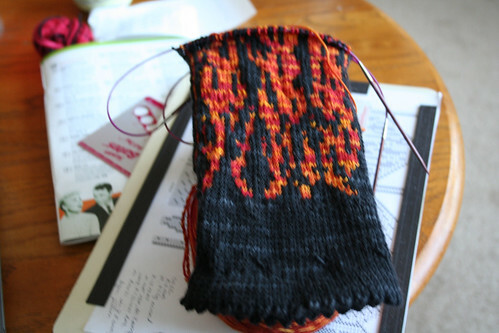 I’ve been horribly busy — I’ve got a lot on my plate right now, so that my knitting time has been curtailed. This will likely continue through most of February, so be forewarned. That said, here is the current state of the mitten. And a blurry picture at that. Lucy continues to feign innocence . . .
Beautiful kitty picture, beautiful mitten pic! I wish my multiple color projects looked that good “inside-out” !! The mark of a true fiber artist!!!! luv2kitty&Wendy!m. 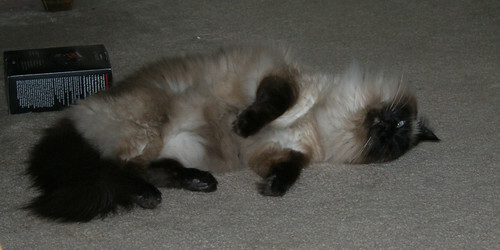 Lucy is definitally up to something, never trust a grinning kitty, LOL!! As you said the other day “Be afraid. Be very afraid.” Lucy being so demure?? A sure sign there’s mischief afoot (apaw??). Can’t wait to see them finished. I love the mittens Wendy! Do you use regular cast on and sew it down for the picot hem for a particular reason, as opposed to prov cast on and knitting it together with the 13th row? Because you feel like it, because it looks better, because you can’t stand the juggling when knitting from two parallel needles, some other reason? I have trouble maintaining a good stretchiness with the sew down method, so I do the other (I think my way might be slower, but I’m not sure). I was just wondering what your reasons are. This is a great case where flaming on a blog is really good 😉 These are sharp! lucy… tsk tsk tsk…. what is she up to now? Oooh…that IS a great mitten! When you first mentioned this design to me — I could not WAIT to see the WIP — it was certainly worth the wait!!!! WOW your mitten is beautiful inside as it is outside, I think i won’t even mind wearing it inside out! I can’t wait to see the finished pair! Hey now… you tell that stuff that’s interfering with the knitting to take a hike. One must have priorities. 😉 But seriously, hope you get to relax when you need it. this is more a query than a comment. I’m adapting an aran sweater pattern, knit in the round, as a cardigan. So now I’m wondering whether I could knit it in the round, & steek the front opening. A quick Google lead me to your site, so I’m asking one experienced in such matters – how should I best go about this? The yarn is 20% wool, the rest being acrylic etc. I’m not that rich, & our LYS doesn’t stock that wonderful a range. The mittens are looking beautiful. I always appreciate you answering questions from the comments — it’s great for learning. Lucy’s innocent act is very convincing. Thanks for letting us know about your edging! And when you get that pattern up and running, I will certainly purchase one! Those mittens are awesome! I am a commuter, too, from the ‘burbs to Chicago’s Loop. Sock and mitten knitting fits the bill! Everyone is always curious to see what I’ve got going. 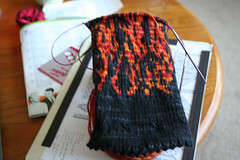 I ususally knit with thicker yarn for my mittens, make them larger and then felt them. 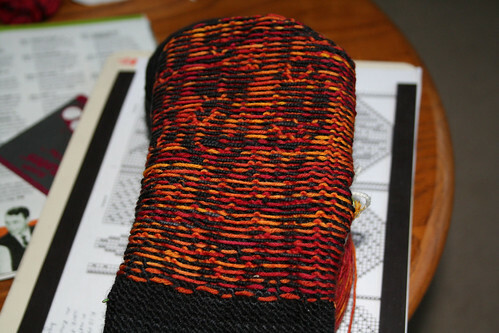 However, I like what you’ve done here and can’t wait to try out a pair with sock yarn! You’ve inspired me! Keep up the great work!! These are my favorite mittens EVER. Gorgeous!! How could your hands not stay toasty when they’re engulfed in flames? ?